Boy, this is getting tough. Separating the top 6 horses is splitting hairs. They all deserve to be up there. His race in the SA Derby was just what he needed to set him up for a peak performance on the first Saturday in May. There’s certainly no reason to lower him after all this time on top. Blinkers off in the final Derby prep was a bit of a concern; never like equipment changes this close to the big race, but he handled it well and was very professional, and you had to love the way he battled back, much like Silver Charm in the ’97 SA Derby. He’s lost three of his last four starts, because of his inability to quicken. He doesn’t have a big turn of foot and just grinds it out, so he’ll need some help from the mile and a quarter, where the constant pressure he applies could wear his opponents out. He’s certainly not a solid No. 1, and I’ll have to give the top contenders a closer analysis once the final preps are run. Some may drop him a notch or two after the big efforts by the Wood and SA Derby 1-2 finishers, but, traffic problems aside, I still believe that with only three slow breezes he was nowhere near fully cranked in the Florida Derby and that the real Union Rags will emerge on Derby Day. It’s only an opinion, but it looks to me as if Matz went into the race hoping the colt could win off those three breezes, but did not want to risk him peaking a race too soon, coming off that easy Fountain of Youth score. I would expect to see several serious works leading up to the Derby, unlike the Florida Derby. So far, this colt’s pattern is to have his races won by the eighth pole. The two times he hasn’t he failed to catch the leader inside the final sixteenth, and we all know the Derby is won before the eighth pole. Leparoux just has to be more aggressive with him and use his big turn of foot on the far turn. Some question his ability to get 10 furlongs, but he sure runs like a horse who will have no trouble stretching out that far. I had him at No. 4 before the SA Derby, and as good as Gemologist and Alpha looked in the Wood I see no reason why they should pass him after his gutsy and brilliant victory over my No. 1 rated horse. And he did it off a two-month layoff and coming home his final three-eighths in a sharp :36 1/5. From all appearances back at the barn and the following morning, the race didn’t take that much out of him. I’ve maintained all along that we don’t know how good this horse really is, but I think we’re starting to find out. There’s no reason why he can’t improve off this race. Some may question using an unknown jockey who recently arrived from Hastings Park without an agent, but Mario Gutierrez has ridden him perfectly and is as cool as the horse. He reminds me of Stewart Elliott on Smarty Jones and Jeremy Rose on Afleet Alex. They, like Gutierrez, had too much confidence in their horse and in themselves to give in to the pressure. And congrats to O’Neill, who gave this horse four long, stiff works; something most trainers would be afraid to do. It’s nice to see some old-fashioned training once in a while, and its benefits. One thing about him, he always finds a way to win, and you had to like the fact that he overcame getting bumped 5-wide on the first turn and steadying slightly when The Lumber Man cut in front of him, and then was 6-wide down the backstretch and 3-4 wide on the far turn. His Beyers have increased with every race (75, 81, 85, 95, and 98). There are several logical reasons to like his Wood Memorial win, but perhaps one that’s not quite as logical that I found impressive was the colt throwing his ears straight up right before the wire, despite being under pressure from Alpha, as if he knew he had it won. I just like a horse who knows where the wire is and what he has to do to get there first. When Castellano switched to a left-handed whip, Gemologist came out several paths and was able to engage Alpha just when it appeared as if the Godolphin colt was going to catch him. I saw a lot of Tiznow in him, and how about him out-battling a Godolphin colt to the wire, 11 years after his sire did the same thing to a Godolphin colt (Sakhee) in the Breeders’ Cup Classic. I admit this colt probably should be ranked No. 1 or 2 or at the worst No. 3, but I need some time to ingest everything we’ve seen in the past two weeks. With Alpha breathing down his neck for the No. 5 spot, he gets his chance to move up, stay where he is, or move down in the Blue Grass Stakes. It all depends, not only on whether he wins, but how he does it. If he’s going to pull a Union Rags or a Creative Cause and lose his final prep, he better look awfully good in the process. It’s always difficult getting a good line on a horse when he preps for the Derby on Polytrack. In short, he needs to settle off the pace, as he did in the Gotham, put away some very talented horses, and come home impressively. We’ll also see how he stretches out an extra sixteenth of a mile. I was very tempted to put him No. 5, but decided to wait until Hansen runs in order to get a clearer picture. Coming off a two month layoff, he overcame a bad trip, having to check sharply on the first turn, and still closed fast, falling a neck short. But the key to his race may have come at the three-eighths pole when Ramon Dominguez went to a single left-handed whip to try to keep pace with Gemologist, then hit him again at the five-sixteenths pole. I never like to see a horse under the whip that early, as it usually means the jockey is not feeling the response he wants. But was it the horse or was it Dominguez, who was just returning from a collarbone injury and had only two losing mounts the day before in his return to the saddle? Was his strength at 100 percent or close to it in only his second mount on the card? Did Alpha hang a bit in the final yards after appearing as if he was going to catch Gemologist or was Dominguez starting to feel the effects of his three-week layoff and rushing to get back for this race? Or did Alpha need this race, run over a slow, tiring track after his two-month layoff? Or was it just a case of Gemologist simply out-gaming him? I have no answers; I’m just tossing around some questions to ponder. Whatever the answers are, the bottom line is that Alpha should get a lot out of this race and go into the Derby a fit and dangerous horse. The tendency is to chalk his Florida Derby win up to the slow pace and his ability to take advantage of it and pretty much steal the race. But let’s remember, he’s not a front-runner and his versatility should be commended that he was able to adapt to the scenario that was presented. Byrne and the owners decided to go with a two-prep schedule instead of their original three-prep schedule at the last minute, so they still have a pretty fresh horse. We’ll just have to wait and see how much he’s gotten out of his two starts. There is no doubting this colt’s talent, and he has the pedigree to go along with it. Whether he’s good enough to win the Derby is anyone’s guess, but there’s no reason to think he’s not right up there with the best of them. Pletcher and the owners decided to go by body of work rather than just one race in regard to running in the Derby. After all, he was only beaten 3 ½ lengths and according to Trakus, ran 63 feet farther than the winner. 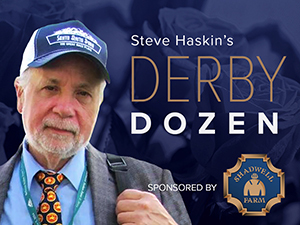 Also, in the past 20 years, four horses have won the Derby after finishing fourth in their final prep, and all were totally ignored at Churchill – Mine That Bird ($103.20), Giacomo ($102.60), Thunder Gulch ($51), and Sea Hero ($27.80). If you liked El Padrino before the Florida Derby and dumped him after that race, you’re not going to be too happy if he bounces back and takes home the roses. Don’t get me wrong, he was flat at Gulfstream and should have run better, even with the loss of ground, but his race was very reminiscent of Thunder Gulch’s in the Blue Grass when he came up flat in the stretch as the 6-5 favorite after winning the Florida Derby and Fountain of Youth. Off days do happen. And for an off day this one really wasn’t that bad, and he did run hard enough to get something out of the race. Giving him the nod over Dullahan only because he has the opportunity to break into the upper echelon with a big victory. But he needs that victory, while Dullahan’s connections can be happy with another good second, especially to Hansen. Bodemeister might very well have pulled off the SA Derby, considering his longshot stablemate put quite a scare in I’ll Have Another and Creative Cause and was beaten a mere half-length. Instead, he has to travel to Hot Springs and compete over a new track against what promises to be a large field. And he has to beat another of his stablemates, Secret Circle. If he runs back to his San Felipe, there is no reason why he can’t get the job done and head to Louisville as a hot commodity, despite having only four career starts. Love him or hate him, he should have no excuses in the Blue Grass Stakes, having won the Breeders’ Futurity over this track and coming off a terrific 3-year-old debut, in which he was a strong second to Howe Great in the Palm Beach on grass. Regardless of what he does in the Blue Grass there still will be questions surrounding him, especially because he has only his fourth-place finish in the BC Juvenile to go by on the dirt. I feel he showed enough in the Juvenile to convince me that dirt and Churchill Downs will not be an issue. I can just picture him picking up horses with that big move and huge stride of his and motoring down the stretch. He’s still as intriguing a future book horse as there is, and looks to be a bargain in the final Future Wager pool. As the big guns run well in their major preps, he fades a bit in the minds of horseplayers. But I still like this colt, and his Derby odds are climbing steadily with every race the others run. I just love the way he’s progressing, and he showed a lot in his two stakes victories this year, even though it was against moderate competition. I like the way this horse looks and acts and his determination in the stretch. He’s certainly not going to back down from a fight. Like Dullahan, I would definitely play him in the future book and hope for a killing. There’s a lot to like about him. He’s another who will be forgotten because his final Derby prep was six weeks out from the big race and people just don’t know much about him. This is a much stronger group than the one Animal Kingdom beat last year. But he’s a beautiful moving horse who is improving with every start; he has the pedigree to get the distance; and he has no problem shrugging off traffic, as he showed in the Spiral when he had horses all around him and it didn’t faze him in the slightest. He also has finished first or second on dirt, grass, and synthetic, so he’s pretty adaptable.